When you’re in Jerusalem take some time to enjoy walking around and exploring the village of Ein Karem (Hebrew of Spring of the Vineyard), today a neighborhood of Jerusalem and when you get hungry check out one of the restaurants (see below). The spring made it possible for settlement there dating from the Middle Bronze Age. According to Christian tradition, Mary, pregnant with Jesus, met Elizabeth, pregnant with John at the spring. 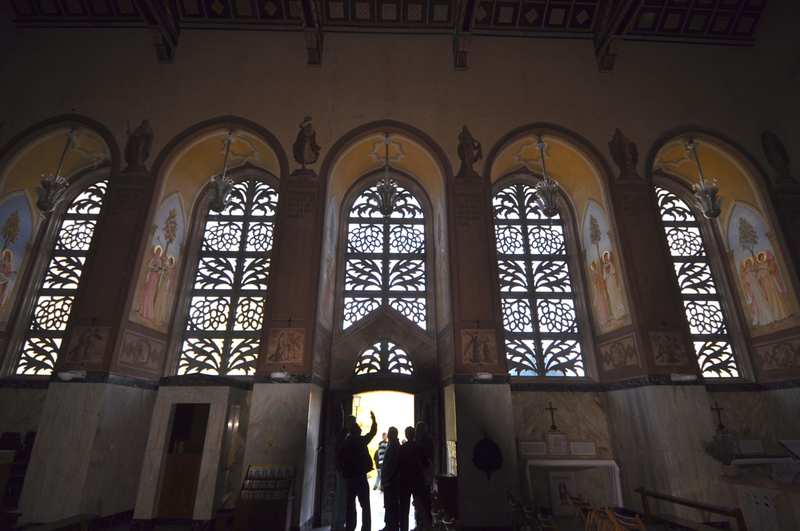 There are two churches named St. John the Baptist, one a Franciscan church built in the second half of the 19th century on the remnants of earlier Byzantine and Crusader churches and an Eastern Orthodox church built in 1894 (restored in 1975), also on the remnants of an ancient church. Inside the Franciscan church are the remains of a Byzantine mosaic floor and a cave where, according to Christian tradition, John the Baptist was born. Below the building a mikve or Jewish ritual bath was found dated to the Second Temple period. The Franciscan Church of the Visitation is located across the village from St. John. The ancient sanctuary there was built against a rock slope, the site where Zechariah and Elizabeth lived and where Mary visited them. An ancient cistern from which, according to tradition, Zechariah and Elizabeth drank, can also be found in the church; the stone next to it is said to have hidden the two from Herod’s soldiers. 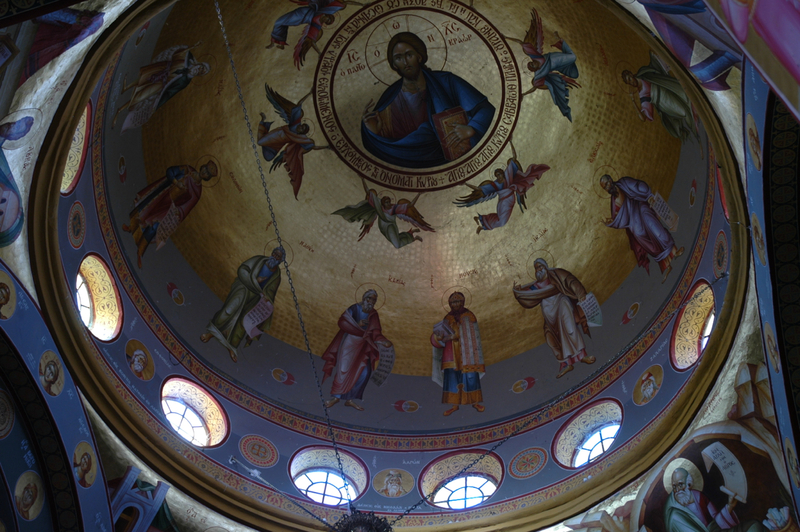 Tradition attributes its construction to Helena, Emperor Constantine’s mother. On the wall of the courtyard are ceramic tiles bearing verses from the Magnificat (the Canticle of Mary from Luke 1:46-55) in forty-two different languages. On the church’s façade is a striking mosaic commemorating the Visitation. The lower level of the church was built in 1862, the upper level was begun in 1938 and completed by Italian architect Antonio Barluzzi in 1955. 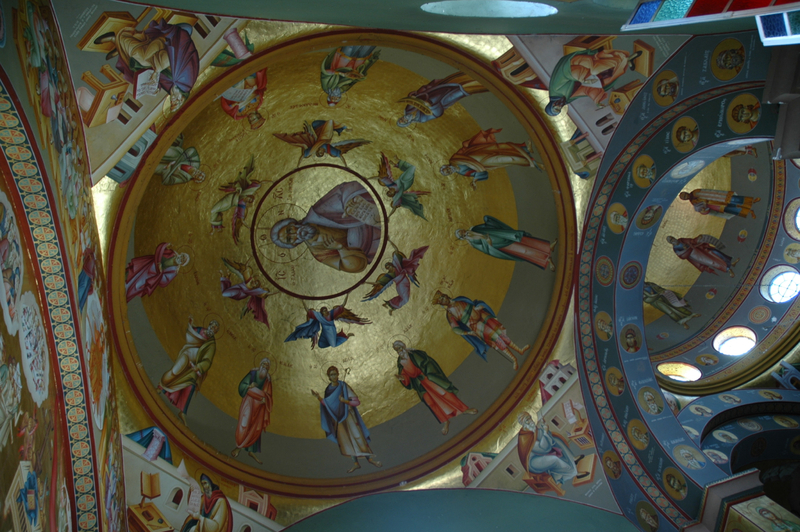 The upper hall is dedicated to Mary, and its walls are decorated with many paintings in her honor. The interior has Italianate frescoes depicting the Visitation, Elizabeth hiding her son John the Baptist, and Zechariah next to the altar in the Temple and beautiful mosaic floors. In one of the frescoes, there is an image of none other than Barluzzi himself. Located up the hill is the Russian Orthodox Church, part of the Gorny monastery, nicknamed Moscovia by the locals, begun in 1905 and only completed in 2005, with its classic gold onions. Take the opportunity to walk or meditate in the tranquil garden of Notre Dame De Sion monastery. Charlotte for those with a passion for a variety of grilled meats and delicious side dishes, kosher. 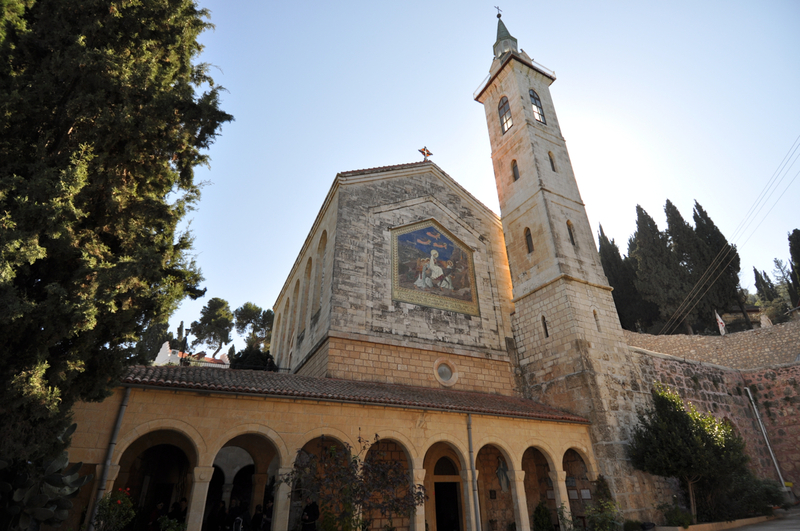 This entry was posted in Architecture, Church, Food, Jerusalem, Mosaics and tagged Antonio Barluzzi, Ein Kerem, John the Baptist, travel on January 15, 2013 by Shmuel Browns. Capernaum is an important place to visit because not only is it an interesting archaeological site but it has historical importance in understanding Jewish life in the time of Jesus. According to the Gospels Jesus lived in Capernaum during much of his ministry in the Galilee. The site was first discovered in 1838 by the American biblical geographer Dr. Edward Robinson. British explorer Captain Charles Wilson identified the ruins of the synagogue in his survey of 1866, and in 1894 a part of the ancient site was purchased by the Franciscan Custody of the Holy Land – this is the site most often visited. Archeological evidence (from excavations by the Franciscans between 1968-84) indicates that the fishing village of Capernaum was established at the beginning of Hasmonean rule – the earliest coins found at the site date from the 2nd C BCE. The town, near the border of the province of Galilee, was on a branch of the Via Maris trade route. At the time of Jesus, Capernaum included a customs post and a small Roman garrison commanded by a centurion. Although the natural building material was black basalt, from the remains that we see today we know that the town had an impressive synagogue in white limestone (the floor plan is similar to the 4th C synagogue at Korazim and the 3rd C synagogue at Baram, a comparison would make an interesting subject for another post) and an octagonal church (5th C), a short distance from one another. Since the town did not participate in either of the two major Jewish revolts against Rome village life continued quietly until a winter day in 749CE . On January 18th Capernaum was badly damaged by the Golan earthquake and was rebuilt a short distance to the northeast but little is known of its history, decline and eventual abandonment sometime in the 11th century. Despite the importance of Capernaum in the life of Jesus, there is no evidence of any construction during the Crusader period. 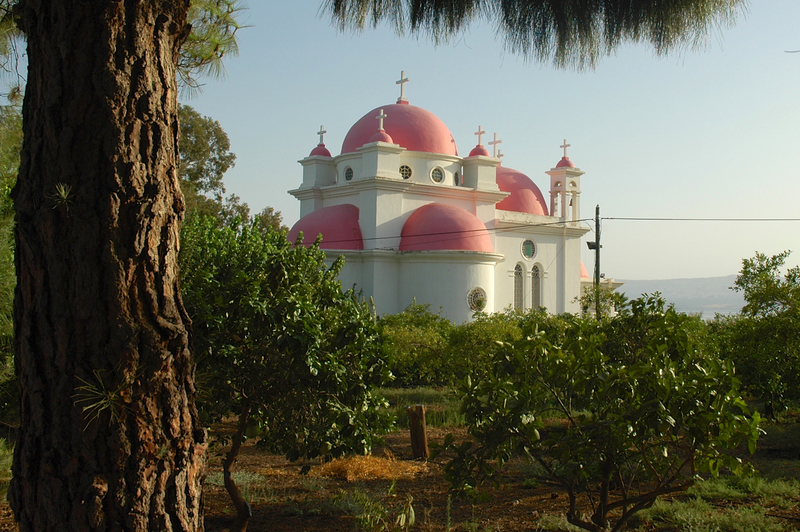 The small, pink-domed Greek Orthodox Church of the Seven Apostles (built in 1931) marks the site to which the village of Capernaum was relocated after the earthquake. 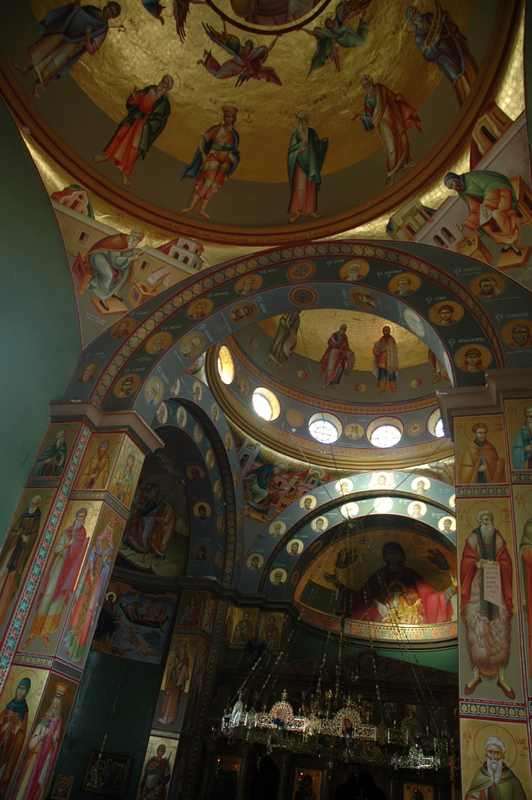 A monk greeted us when we entered so we asked why the church had pink domes – he replied that it was the paint they had found at the local hardware store. The church is dedicated to the seven apostles (Simon Peter, Thomas called Didymus, Nathanael from Cana in Galilee, James and John, the sons of Zebedee, and two other disciples not recorded (John 21). Jesus appears for the third time, this time by the Sea of Galilee. 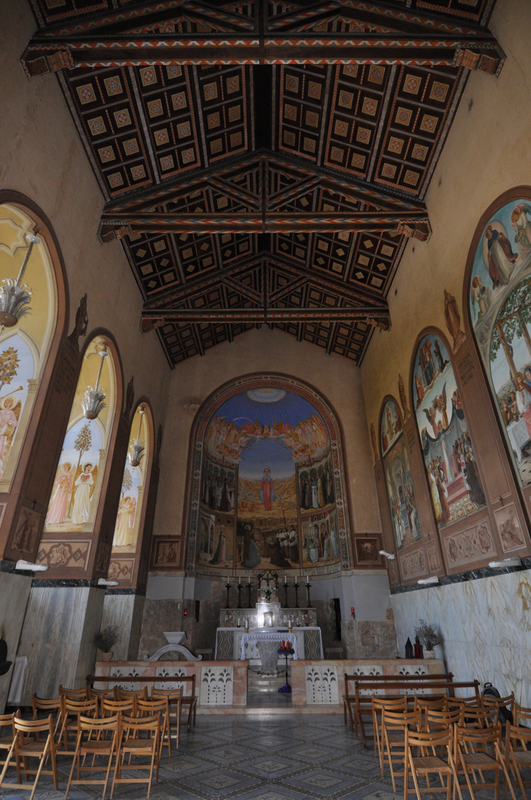 The interior of the church is covered with paintings and I got some photographs of them. Archeological excavations carried out at four locations on the site between 1978-82 revealed the foundations of residential dwellings with the same black basalt dry-stone walling as the earlier constructions in Capernaum. Of special note are the remnants of a two-meter-wide basalt wall along the shoreline that may have been part of a quay along the entire lakefront of the village and two stonework jetties extending at right angles into the lake. This would have provided both sheltered anchorage and a slip for hauling boats out of the water. This post is especially for a friend, Alex Koch who is an art historian and guide who lives in Munich and loves Israel. This entry was posted in Art, Church and tagged Capernaum, Galilee, Greek Orthodox church, Jesus, Kinneret, life of Jesus, Sea of Galilee, steps of Jesus on November 1, 2012 by Shmuel Browns.